Kids can make great workout buddies; it may be a whole different type of exercise but you can be certain to burn some calories. Here is a great list of fun ways to workout with your kids. Have a dance party – you could create your own playlist of your kid’s favorite music or just turn on the radio. Invest in a jogging stroller – you not only will get in a great cardio workout but this may be the perfect way to return home with a sleeping toddler. Make a play date at a local park – no need to purchase your own playground equipment if there are local parks, find a few different parks to vary up the scene and run around with your kids. 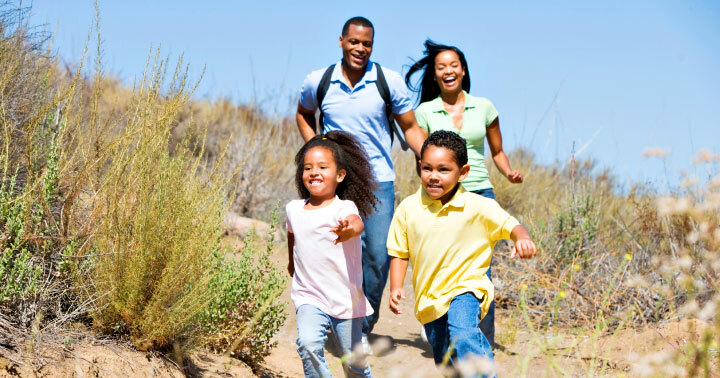 Go on a safari – create your own fun safari by hiking through a national park. Family bike ride – if your kids can’t ride yet consider a pull-behind, you will get even more of a workout pulling a trailer. Pull out a workout video – you would be surprised at how many exercises your kids will attempt to do with you. If they climb on your back during a plank or act as a weight during squats you may even get more out of your workout. Mix cleaning and exercising – cleaning is a chore that needs to be done, why not add some lunges while vacuuming or squats as you fold clothes. Take advantage of naptime – This is the time to really get in a good workout when your little distractions are sleeping. Go swimming – warm weather is here and the area swimming pools and water parks will be open soon. Skate out some energy – take your family roller skating, believe it or not you can burn up to 600 calories in one hour.